Our Kennesaw and North Georgia warehouse furniture and trash removal division works with property management companies, retailers, public storage companies, contractors, realtors, retail commercial landlords, business owners, Attorneys, and Fortune 500 companies to assist them in getting rid of their office and warehouse junk. We do complete warehouse furniture and trash removal from A to Z. We remove warehouse furniture and trash, cardboard boxes, pallets and shipping crates, office furniture, shipping supplies and equipment, industrial machines, shelving units, manufacturing equipment and machinery, office paper and documents, appliances, all electronics, storage unit contents, workstation cubicle panels, business machines, computers, copy machines, and MUCH MORE. Basically anything non-hazardous! As our name suggests we are dedicated to “going green” which means that we sort every job for warehouse furniture and trash removal, paper, plastic, electronics, appliances, metals, tires, warehouse trash etc. that can be donated or recycled. We try to make the landfill our last stop. We do this by having our own large storage facility where we can drop off items that don’t need to be thrown away. Then they can be taken to their proper destination (donation center or recycling plant) at a later date. This helps us donate, reuse or recycle approximately 75% of what we pick up. The remaining 25% are disposed of in the most eco-friendly manner possible. 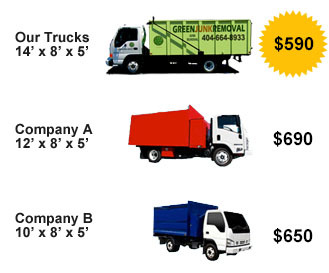 Furthermore to encourage recycling and donating whenever possible, we quote our lowest pricing for projects where the majority of the items being hauled off can be recycled and donated.